After last year’s performance of being the only losing captain on tour, no-one was more surprised than me to receive the call from our esteemed tour secretary to once again lead our ragtag band of merry men against an anticipatedly strong but friendly team from Kingswood. However that sort of opportunity couldn’t be turned down and after a morning spent scouring the street markets of Stroud with Simon International and a solid lunch in the pub, the cracking weather continued and posed in interesting problem regarding the toss. On what looked like another high-scoring pitch I was keen not to repeat the mistake of last year of not posting a big enough score, but equally I took the opposing skipper’s pleadings that they were short of their opening batsmen and bowlers due to an errant tennis match with a hefty pinch of salt. In the end the toss was ‘negotiated’ as neither of us had any great urges to bat or field and as we had some extra players (in the form of Shawn and Will) we could lend them to ‘help’ their fielding, so batting it was. At this point opening the batting seemed a great idea, but within the first over, having middled the first of four caught-and-bowled’s easily back to the opening Kingswood bowler, the spectre of the duck-suit quickly became reality as it was (rather too) eagerly unpacked for the first time on tour. Struggling Chris O’Reilly was joined by in-form PJ and they began to rebuild from the dodgy state their captain left them in until Paul was bowled for 9 before he could really get in. Fortunately the talismanic skipper Ben came to the rescue (yet again) and set about compiling runs firstly for a 50 partnership with Chris and then another one with Jake who weighed in with his usual selection of lusty blows. Ben fell to another caught-and-bowled for an excellent 65 in the 24th over and from last year’s experience it looked like we’d need every single one of those runs and more. Another batsman in superb form in the form of Richard Johnson joined Jake at the crease and purred his way to an unbeaten 39, anchoring the second half of the innings. When Jake avoided his jug and was bowled for 49, perpetual tourist Erdsy got off to a cracking start with an immaculate cover drive, but was another victim of the bowlers’ handy knack of catching for 5. 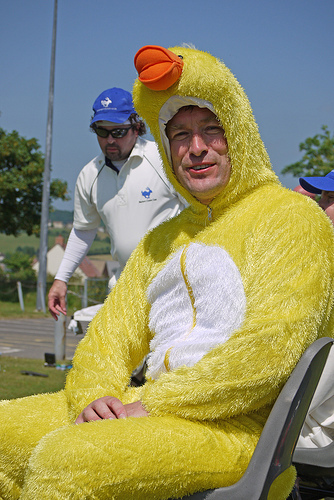 Phil Morris avoided the duck suit, but somewhat inevitably Jon Lambdon couldn’t and it was rapidly and sweatily handed over by the skipper. Runs were harder to come by in the second half of the innings, but helped by our friend Extras (38) the tail wagged strongly with Tony Timms (10) and Tourmeister Mike Ireland (1) making it to the penultimate over with a strong total of 226, but would it be enough..? There was only one way to turn when it came to opening the bowling and the spin twins of Ireland and Timms did us proud. Tony struggled a little up the hill but Mike rolled back the years and snuck out the first opener in his third over, and making it impossible for the skipper to take him off until he’d completed 8 overs, 1 wicket for a miserly 18 runs. Finding willing recruits to bowl up the hill was harder though and having tried the Lambinator who would have been less expensive if I’d just taken £10 notes and laminated them on the pitch, Richard Johnson stepped up to the plate he had earlier cleared during the tea break. In consecutive overs he removed the incumbent batsman and just after the halfway point things were intriguingly balanced at 99 for 3. Ben continued the watertight bowling down the hill and contained our friend McCubbin who had put us to the sword last year and although the runs were coming, add two wickets to the score and the game could change completely. Which it did as Ben slid in a slower ball which McCubbin scooped into the air and the stand-in skipper Henderson began to make amends for his batting and took his second, harder catch of the day. The very next over an excellent piece of fielding saw him run out the new batsman without scoring. As the run-rate started to climb, the bowling needed to be tighter that James Beavan’s wallet during last orders. Having suffered two failures with the bat it was up to a pair of Pauls (Johnstone and Henderson) to bowl the death overs. With 34 needed off the last 5 overs and 5 wickets still in hand, PJ finally made the breakthrough, followed quickly by two wickets for Henderson and Kingswood then proceeded to spectacularly implode with a smart stumping by Chris O’Reilly. 16 required off the last over and one wicket remaining, the question was not what the result would be , but would the Barford team have the energy to get over the line. Fortunately the final wicket fell with 2 balls to spare and so the troops left the field exhausted but very happy to win such an entertaining game played in a great spirit. Victories on tour are as sweet as they are rare, but this one was particularly succulent, given the result against the same opposition last year, but also the weather, friendly hosts who pushed us to the limit and plenty of moments to remember all played their part.